A shorter version of this essay appeared in the Atlantic. The 2010 Afghanistan Mortality Survey showed that, from 2004 to 2010, life expectancy had risen from just 42 years — the second-lowest rate in the world — to 62 years, driven by a sharp decline in child mortality. Doubts immediately crept in about the findings, particularly the child mortality decline, but a new survey in 2011 confirmed that child mortality was indeed declining rapidly, and the United Nations Children’s Fund’s September 2013 global report calculates an overall decline for Afghanistan of more than 25 percent from 2000 to 2012. Afghanistan’s progress against mortality reflects the success of providing health aid that differed radically from the bulk of American aid to Afghanistan during the war. The USAID program that contributed to the decline was a multilateral effort coordinated by Afghanistan’s own Ministry of Public Health. Results were verified by random sampling, and some funding was linked to measures of performance. This internal policy experiment, however, was destined to provoke resistance. More surprising is the source of resistance to an aid program that attempted to stop simply throwing money at a problem and focus on building sustainable systems: auditors. “Stunning Progress” or “Implausible and Invalid”: The Afghanistan Mortality Survey 2010? Disclosure: The author's brother is a foreign service officer who has served in multiple USAID missions, including Kabul. At the simplest level, these mortality numbers provide vindication for aid bureaucrats from the United States, the World Bank, and the European Commission who from 2004 to 2011 spent nearly a billion dollars on Afghanistan's public health system. But this was not just a victory for "aid," generically. Afghanistan's progress against mortality reflects the particular success of a way of doing aid in the health sector that differed radically from the amateurish, militarized, and externally imposed modus operandi of the bulk of American aid to Afghanistan during the war. As aid money poured into the country in 2003 there was enormous pressure to spend quickly and to subordinate humanitarian priorities to the counterinsurgency war effort. "Winning hearts and minds" was the informal rallying cry for this effort, as the US military published an official manual for commanders in the field on "using money as a weapons system." In reality, only about 20 percent of American humanitarian and development aid money was routed through the US military. But even projects run by America's largest civilian aid agency, USAID, were often focused on "stabilization" rather than development. They targeted areas of insurgent activity, took orders from military commanders about where and when to work, and erred on the side of making a visible splash rather than a long-term impact. Independent relief organizations working in Afghanistan complained bitterly about the US military's Quick Impact Projects to build schools and clinics, dubbing them "quick impact, quick collapse." In the case of two schools examined by US auditors, the collapse might be literal - military contractors had built walls so flimsy they could not support the schools' concrete roofs, endangering schoolchildren in an area of frequent seismic activity. Metaphorically, the collapse refers to the fact that the military refused to budget for teachers for the schools or nurses for the clinics - those were considered government functions, and working with the government was off-limits for military aid programs. The United States agreed to sign on to the health program. For many technocrats within USAID, this was a chance to show what aid could do when done right. Rather than the United States going it alone, this was a multilateral effort, pooling the money and technical expertise of multiple donors. Rather than bypassing the Afghans and channeling money through the US military or for-profit contractors, the health program was coordinated by the Afghan government's own Ministry of Public Health. Rather than winning hearts and minds, the health program would aim to save lives; and rather than concentrating its resources in the Taliban strongholds of the south and east, the Ministry of Public Health would distribute funds equitably across the country. This all sounds quite idealistic. But given the Afghan government's penchant for corruption and extremely weak capacity to operate in many parts of the country, could it actually work? Crucially, this was not to be a blank check to the Karzai government. While the health program was "Afghan owned," it was heavily dependent on international aid organizations, not just for finance but also for implementation. Given the Afghan government's weak capacity to deliver basic services in remote areas, compounded by American reluctance to channel aid monies directly through government coffers, the program was designed as a collaboration between the Ministry of Public Health and an array of international and domestic nongovernmental organizations (NGOs). These NGOs, such as the Aga Khan Foundation or the American charity World Vision, typically took responsibility for providing services in clinics spanning several districts or an entire province. By carving up the country among these organizations, the ministry was able to establish a fairly uniform, nationwide rural health care system from a baseline of virtually nothing in just a few years. In addition to picking trusted partners, the health program invested heavily in verifying their work. Arguably, the true hallmark of a good aid program is not multilateralism, country ownership, or public-private partnership, but an unflinching commitment to independent, transparent evaluation of the results. Once again, aid to Afghanistan's health sector stood out from much of the rest of the aid portfolio in the country, particularly the American aid portfolio. To track whether the whole system was working, Johns Hopkins School of Public Health was contracted to monitor hundreds of randomly sampled clinics across the country each year, issuing performance scores on dozens of indicators for each province. They documented impressive gains. 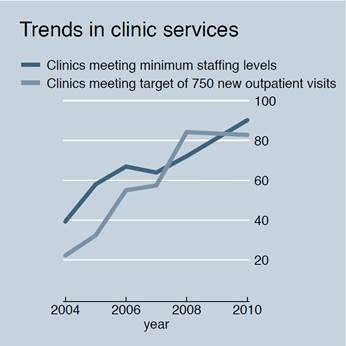 From 2004 to 2010, the share of clinics meeting minimum staffing levels rose from roughly 40 percent to nearly 90 percent, and the proportion that met their annual target of at least 750 new outpatient visits rose from around 20 percent to more than 80 percent. To add to the results-oriented focus of the health program, the World Bank even experimented with performance-based payment incentives for the NGOs based on their scores on these indicators, equivalent to a 10 percent bonus payment for meeting the targets. In short, Afghanistan's health program was not only a huge victory for international efforts to build a functioning Afghan state where none existed, but a radical departure from how the United States has typically run its aid efforts, particularly in our two largest aid programs of the last decade, Iraq and Afghanistan. Inevitably, this internal policy experiment was destined to provoke resistance. More surprising has been the source of resistance to an aid program that attempted to stop throwing money at the problem and focus on building sustainable systems: auditors. John Sopko is the US government's chief auditor for Afghanistan, and he is, for all intents and purposes, opposed to giving any American aid money to Afghan institutions. Sopko is a former prosecutor who knows his way around Capitol Hill, having worked for Rep. John Dingell (D-MI) and Sen. Sam Nunn (D-GA) as an investigator and counsel. In July 2012, President Obama appointed Sopko to become the Special Inspector General for Afghanistan Reconstruction, or SIGAR, an ad hoc office created to investigate fraud and waste in American reconstruction efforts. He presides over a staff of nearly 200 people tasked by the White House to be the experts on all aid to Afghanistan across multiple federal agencies, including both civilian efforts at USAID and the Department of State, as well as the Pentagon's support for the Afghan National Police and Army. In September 2013, Sopko's office issued a new report calling for the suspension of USAID's $236 million Partnership Contracts for Health program. This program constitutes the bulk of the direct American support for the Ministry of Public Health's work, and finances essentially all health services for 13 Afghan provinces. The funding freeze would have gutted the rural health system that donors have worked for a decade to build and that USAID credits with the dramatic surge in life expectancy. So why shut down such a successful program? The short answer is an overabundance of caution. From an auditor's perspective, it is riskier to give Afghans money or health care than to shoot them. Strikingly, the auditors' report calling for the suspension of the health program does not claim any evidence of serious fraud or waste. Instead, the SIGAR report raises questions about the Afghan government's ability to manage aid money well, including a lack of internal financial controls within the Ministry of Public Health, evidence that some salaries were paid in cash, and the absence of double-entry bookkeeping. Even before this latest report, Sopko had appealed to Congress to reconsider future aid to the Afghan government. Over the summer, the SIGAR public affairs office launched an accompanying media blitz complete with a New York Times editorial expressing grave concern over "lapses in accountability" and a Twitter account tweeting mundane ways in which US agencies are failing: "State Dept. never finalized draft 2010 US anti-corruption strategy for #Afghanistan" or "USAID could not provide documentation showing methodology used to calculate $236M program cost estimate." This outreach culminated with a publicity stunt demanding that State Department, Pentagon, and USAID officials engage in public self-criticism by nominating a top-10 list of their own worst aid projects. Sopko's antigovernment spending campaign caught the attention of Tea Party members in Congress, including Rep. Jason Chaffetz (R-UT), chair of the Subcommittee on National Security, Homeland Defense, and Foreign Operations. Chaffetz called hearings on USAID's plans to work more closely with Afghan institutions - especially as US troops and personnel withdraw in 2014 - and called Sopko to testify and confirm his own reservations: giving money to the Afghan government is simply too risky. This stance toward risk, completely indifferent to the potential rewards of aid and focused solely on compliance with federal procurement regulations, epitomizes what former USAID administrator Andrew Natsios has termed "the clash of the counter-bureaucracy." After leaving his post in the Bush administration, Natsios published a widely circulated essay decrying the multiple layers of financial controls and red tape as the single biggest obstacle to effective development assistance for American agencies. The picture Natsios painted is of an American aid system whose definition of accountability is entirely upside down, prioritizing a well-documented paper trail of receipts and audit reports over any concern for measurable results. The result is paradoxical. The United States spends billions of dollars on "state building" in Afghanistan while systematically bypassing the Afghan state with our aid. Most of that aid is channeled through American businesses and charities, not because they are more successful at getting things done but because they have become experts in the formats required by the thousands of pages of Federal Acquisition Regulations. As economist Justin Wolfers recently joked, "The most important lesson in economics is knowing the difference between a million, a billion, and a trillion, and which to care more about." Since 2001, the United States has spent approximately $89 billion on reconstruction in Afghanistan - of which just $20 billion went for civilian, development, or humanitarian aid - while spending roughly $640 billion waging war within Afghanistan's borders. America's total war costs are almost certain to top a trillion dollars once veterans' benefits and medical expenses are included. It is economically irrational (and borderline cynical) to suggest that shutting down an extremely successful aid program over a few million dollars in poorly documented spending is a priority for a war effort hemorrhaging hundreds of billions of dollars per year. Critics like Chandrasekaran may be right that USAID failed at implementing its piece of the counterinsurgency strategy in southern Afghanistan. Another interpretation of the same facts would be that the counterinsurgency strategy was conceptually flawed, and humanitarian and development aid projects will never stop lunatics with guns from shooting at schoolgirls. 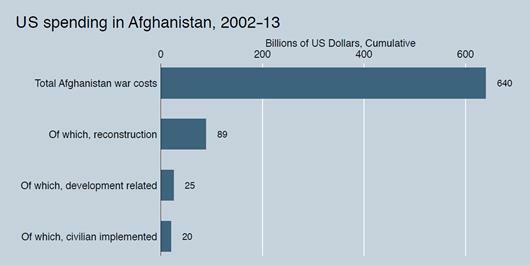 But the real lesson of USAID in Afghanistan is not that help is futile; on the contrary. When America musters its civilian as well as its military resources, and allocates aid for the sake of saving lives rather than winning hearts and minds, it can be incredibly effective, even in the inauspicious conditions of rural Afghanistan. As the United States finds itself trying to rebuild failed states in war-torn societies - from Afghanistan to Mali to Somalia and so on - we have more effective tools at our disposal than aid critics suppose. Our infatuation with military responses to humanitarian crises cannot be blamed on a lack of alternatives. Aid will never be a substitute for a counterterrorism strategy. But beyond hunting bin Laden to make America safer, American leaders have sold the war in Afghanistan in lofty terms, as an altruistic fight for the benefit of Afghan women and children terrorized under Taliban rule. If, when presented with the means and the opportunity to save the lives of thousands of those very same mothers and children, America retreats on the grounds of procurement rules and auditing queries, this narrative becomes difficult to maintain. Quil Lawrence, "Gains in Afghan Health: Too Good to Be True?" All Things Considered, NPR, January 17, 2012, http://www.npr.org/2012/01/17/145338803/gains-in-afghan-health-too-good-to-be-true. This calculation is based on the Associated Press report of a decline in under-five mortality from 191 in the 2006 Afghan Health Survey conducted by Johns Hopkins University to 97 per 1,000 live births in the 2010 Afghanistan Mortality Survey. These rates are applied to United Nations estimates of Afghanistan's population in 2010 of 28.4 million. These population estimates are admittedly imprecise given the lack of a recent census. The final variable necessary to convert mortality rates into absolute numbers of deaths is the crude birth rate (CBR), i.e., the number of live births per 1,000 members of the total population in a given year. The 2010 Afghanistan Mortality Survey reports a CBR of 35.6, which I apply to both periods. This yields a total of 98,070 deaths of children under five in 2010 compared to 193,108 deaths if the rate from the 2006 survey had been held constant. Lawrence, Gains in Afghan Health. A summary of Hill's concerns and a link to a slide presentation he made at the Center for Global Development in 2012 are described in Victoria Fan, "'Stunning Progress' or 'Implausible and Invalid': The Afghanistan Mortality Survey 2010?," Center for Global Development, June 6, 2012, http://bit.ly/GXbmju. The figure on the next page shows the estimated rates of under-five mortality from five independent surveys. 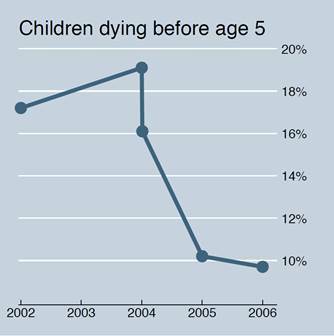 Note that child mortality is measured with a considerable lag, and points are graphed according to the "reference date" of the mortality estimate, typically the mid-point of the five-year period immediately preceding the survey. The 2002 figures are taken from Shivam Gupta, Muhammad Shuaib, Stan Becker, Md Mokhlesur Rahman, and David H. Peters, "Multiple Indicator Cluster Survey 2003 in Afghanistan: Outdated Sampling Frame and the Effect of Sampling Weights on Estimates of Maternal and Child Health Coverage," Journal of Health, Population, and Nutrition 29, no. 4: 388. The child mortality rate was not officially adopted by UNICEF because of concerns about poor data quality. The first 2004 estimates are taken from Afghanistan Ministry of Public Health, Afghanistan Health Survey 2006: Estimates of Priority Health Indicators (Kabul: Ministry of Public Health, 2006). Unlike most of the other studies, the Afghanistan Health Survey reports a 95 percent confidence interval for the under-five mortality-rate estimates, which range from 149 to 233 deaths per 1,000 live births. The second 2004 estimates are taken from Ministry of Rural Rehabilitation and Development and Central Statistics Organization, National Risk and Vulnerability Assessment 2007/08: A Profile of Afghanistan (Kabul: Ministry of Rural Rehabilitation and Development and Central Statistics Organization, 2009). The 2005 estimate comes from Central Statistics Organization and United Nations Children's Fund, Afghanistan Multiple Indicator Cluster Survey 2010-2011: Final Report (Kabul: Central Statistics Organization and United Nations Children's Fund, 2010), http://cso.gov.af/Content/files/AMICS.pdf. The 2006 estimate is from Afghan Public Health Institute, Afghanistan Mortality Survey 2010 (Kabul: Afghanistan Ministry of Public Health, 2010), http://measuredhs.com/pubs/pdf/FR248/FR248.pdf. The figure shows the preferred estimate from the report, which notably excludes the South zone due to the data concerns mentioned in the main text. For the UNICEF figures that extrapolate to years in which no survey data are reported, see United Nations Children's Fund,Levels and Trends in Child Mortality: Report 2013 (New York: United Nations Children's Fund. 2013), http://uni.cf/GXmsVz. Ashraf Ghani and Clare Lockhart, Fixing Failed States: A Framework for Rebuilding a Fractured World (Oxford, UK: Oxford University Press, 2009). Afghanistan Ministry of Public Health, A Basic Package of Health Services for Afghanistan - 2010/1389 (Kabul: Ministry of Public Health, 2010), http://anpha.af/docs/BPHS_2010-English.pdf. Formally, Sopko's position is that certain safeguards must be in place before direct assistance through the Afghan government is advisable. However, it is not clear that any existing Afghan institution meets those criteria, even after years of capacity building and governance aid. For further details, see John Sopko, "Direct Assistance to the Afghan Government Presents Risks," Testimony before the Subcommittee on National Security, Homeland Defense, and Foreign Operations, Committee on Oversight and Government Reform, House of Representatives, February 13, 2013, http://www.sigar.mil/pdf/testimony/2013-feb-12-ig-testify.pdf. Editorial Board, "The Afghan Legacy," New York Times, July 18, 2013, A18. Andrew Natsios, The Clash of the Counter-Bureaucracy and Development (Washington, DC: Center for Global Development, 2010), http://www.cgdev.org/content/publications/detail/1424271. SIGAR (Special Inspector General for Afghanistan Reconstruction), Quarterly Report to the United States Congress, April 30, 2013 (Arlington, VA: SIGAR, 2013), http://www.sigar.mil/pdf/quarterlyreports/2013-04-30qr.pdf. The total war cost estimate of $640 billion is reported in Anthony H. Cordesman, The US Cost of the Afghan War: FY2002-FY2013 (Washington, DC: Center for Strategic and International Studies, 2012). The reconstruction figures in the text and in the accompanying figure are taken from SIGAR, Quarterly Report, Appendix B, 182. Rajiv Chandrasekaran, Little America: The War within the War for Afghanistan (New York: Random House Digital, 2012).